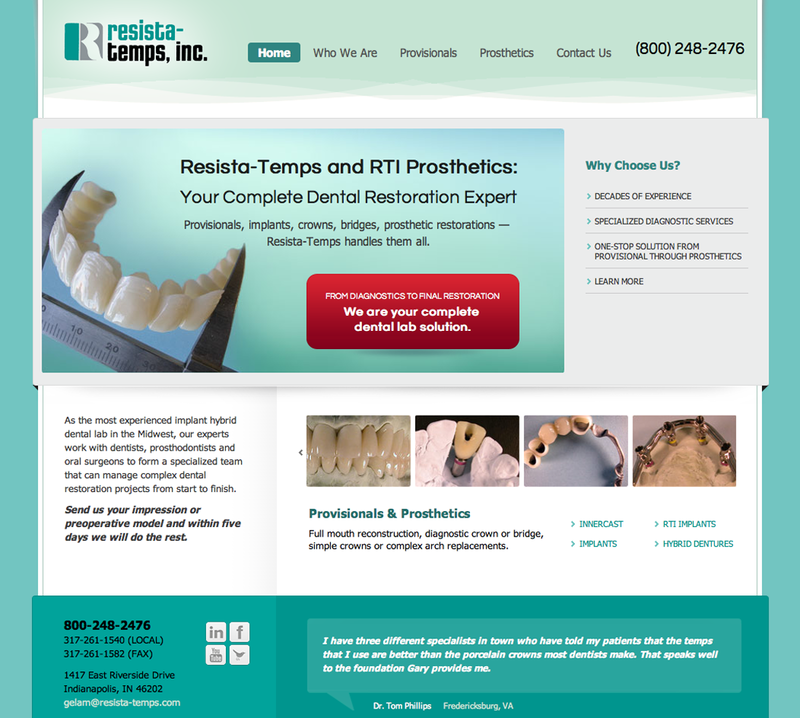 Web Design Case Study: Resista-Temps, Inc.
We launched a new website for Resista-Temps, Inc. today. 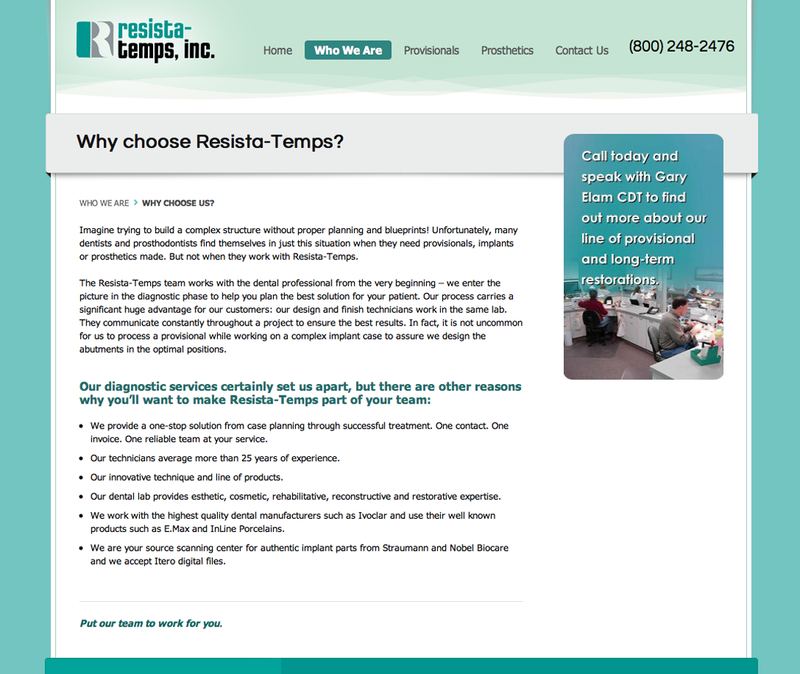 Resista-Temps came to TBH Creative with the need to add a new product line with equal emphasis to their existing temps products. Our first step was to revisit the site organization and assist with the wording for the new pages while enhancing a few of the older pages. Once that was established, we redesigned the homepage and template elements including the banner and footer. We recoded all page elements for the newest and cleanest coding and also removed the Flash elements with JQuery code for a better mobile experience and easier future updates. The site architecture and new wording increased the site usability and was created to help the user find the information they need faster. 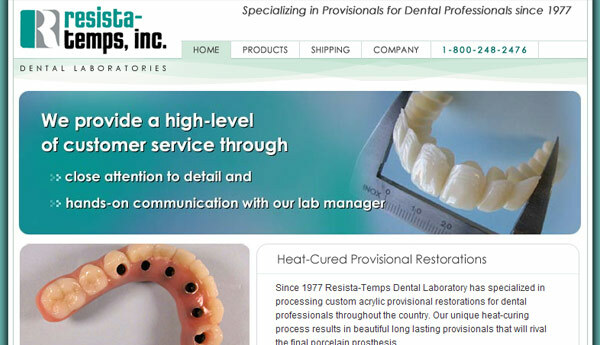 The finished product was a cleaner, easier to navigate website that looked fresh, up-to-date and professional. An interior page from the Resista-Temps redesign. Resista-Temps provides a complete line of dental replacement products for every stage of the process. They are a custom dental laboratory that specializes in the diagnostics, design and fabrication of provisionals, implants, prosthetic restorations and crown and bridgework for dental professionals. Established in 1977, Resista-Temps, Inc. was the first – and still only – lab in the country to specialize in the fabrication of acrylic provisional crown and bridgework. They help dental professionals start with a solid diagnosis and high quality provisional providing long-term case management flexibility. Learn more about what TBH Creative can do for your website. We specialize in several important aspects of web design, including best coding practices, content development, and site architecture.